Every productive garden needs structure if it is to be beautiful as well as bountiful. By structure I mean a carefully thought out layout, a distinctive style and a strong, continuous theme to help each garden feature to sit comfortably amongst its companions. This large back garden is in Polestead, Suffolk. Hard landscaping has shaped the space into smaller, distinctive areas. 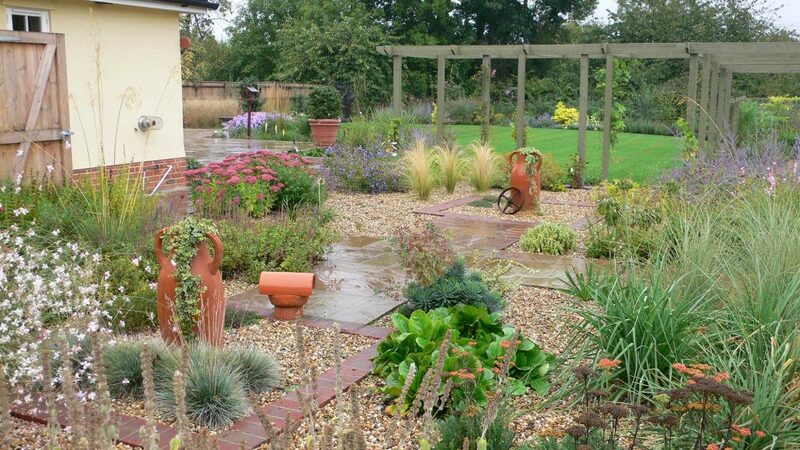 In the foreground is a dry garden where extra gravel has been added to create the ideal soil conditions for the owners’ favourite plants. A wooden pergola frames the views of the beautiful lawn and the lush perennial planting beyond. A true abundance of plants and lots of interest. Hard landscaping builds the areas where you can work, relax, cook and entertain. Then it joins them together with paths that can be used whatever the weather. It adds supports for climbing plants, protection for tender plants, privacy and security. Hard landscaping creates views and vistas and it brings you close to your plants so that you can enjoy them without getting your shoes muddy. No matter whether you are growing flowers, fruit, vegetables or herbs. Living plants need varying degrees of 3 things if they are to thrive. The clay soils in Essex and Suffolk can be challenging for first time gardeners. If left unimproved clay soil is heavy to work with, gets very wet in winter and bakes hard in summer. But it is very good at storing plant nutrients. You will never achieve a garden of abundance if the soil is compacted. 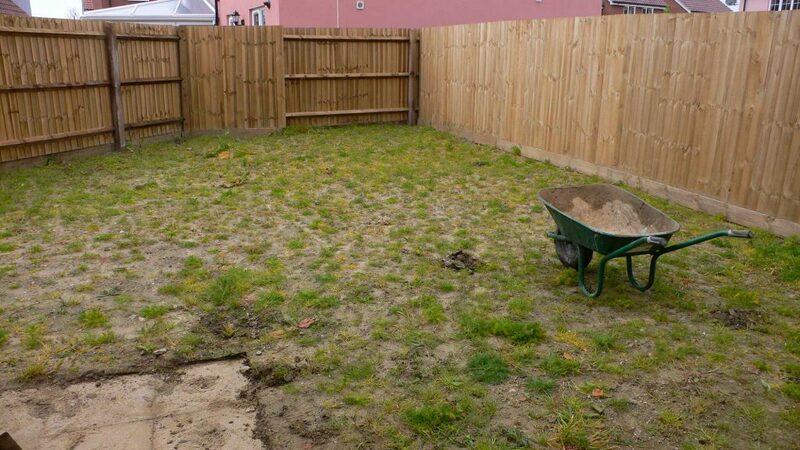 This clay soil in this back garden in Clacton didn’t even want to grow grass. Hard landscaping, improvements to the soil and careful plant choices transformed this patch into a garden that is abundant in colour and interest. I believe that the owners use it all year round. Get a good understanding of the drainage on your plot. There are all sorts of things that can be done to correct any problems it and an experienced local landscaper will be able to help you with that. Improve soil structure by bringing in materials that will make it more suitable for your choice of plants. If you want to grow herbs or alpines, bring in some gravel. If you are thinking about growing perennial flowering plants and grasses, most of them will appreciate the addition of some loamy topsoil. For vegetables, I can’t recommend raised beds highly enough. You have complete control of the soil type you fill them with. Think hard about what you will plant where. Garden centres are very inspirational but don’t be tempted to buy plants unless you know you can give them the right conditions. If you’re an inexperienced gardener, it’s worth investing in a professionally drawn planting plan. When the backbone of your garden is in place, it’s time to get planting. My favourite bit. I love hard landscaping but never think a garden looks truly finished until the plants are in and thriving. Much as I like the bright splash of colour that comes from annual bedding plants, I definitely have a soft spot for herbaceous perennials. These are the plants that grow back every year and just keep getting better and better. Give them a nice thick layer of mulch and you’ll help keep the weeds down. Abundant planting in a back garden in Sudbury, Suffolk. 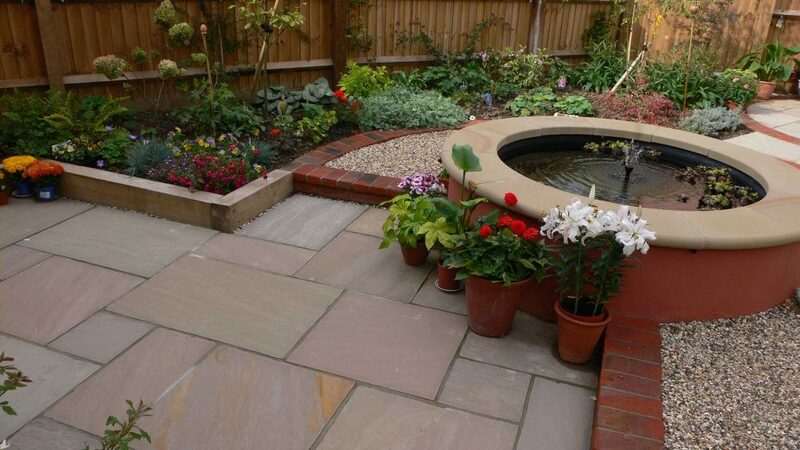 The colour combinations create a soft, relaxed feel in this part of the garden. All of these plants are bee-friendly so on a summers day there’s a gentle hum from the visiting insects. A different view of the Sudbury garden. This time with brighter purples. The violas in the pots are annual plants that can be moved once the display has faded. Viola flowers are edible so this is dual-purpose planting. 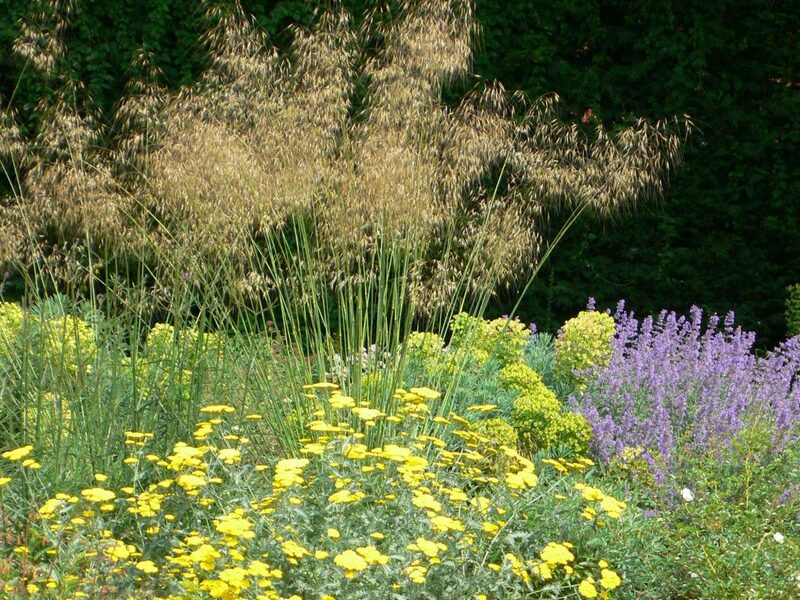 The thing about perennial plants is that they all have slightly different flowering times. So for spring, you could plant a little patch of early flowering hellebores (Christmas roses) that will fade away just as the pulmonaria starts to bloom. From May through to August when you are using the garden the most you can choose herbaceious perennials that will give you colour, scent and movement. Traditional cottage garden plants are fabulous for summer and you can mix and match colours and hues to suit your own taste and style. Herbaceous perennials make for easy garden maintenance. Some might need dead-heading to extend the flowering period. Others – especially tall or climbing plants might need to be tied in to their supports. These are all quick and easy jobs and not at all onerous. Especially on a sunny afternoon. How many of your 5 a day would you like to be able to harvest from your own garden? Apples, pears, raspberries, scrummy strawberries, salads, potatoes, garlic, shallots, pumpkins, courgettes. The possibilities are endless. 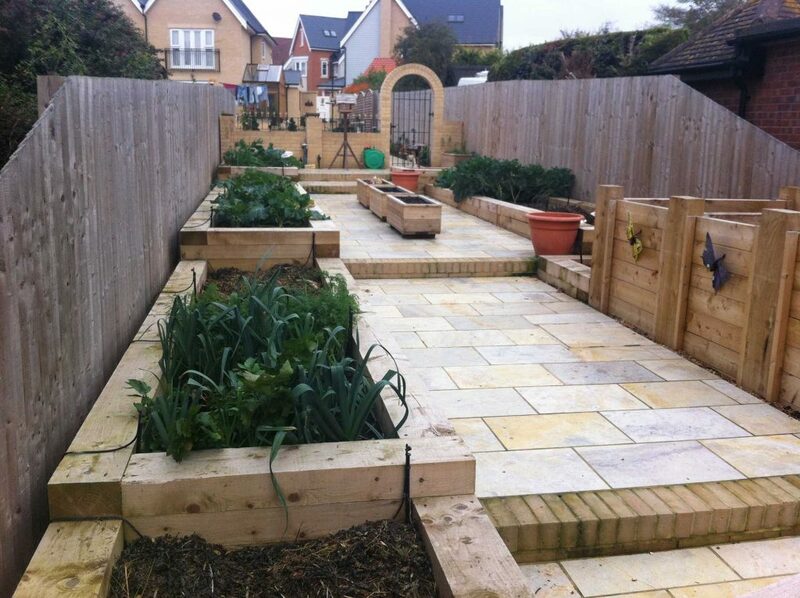 These sturdy raised beds have been filled with a rich compost, ideal for growing vegetables – or indeed flowers. 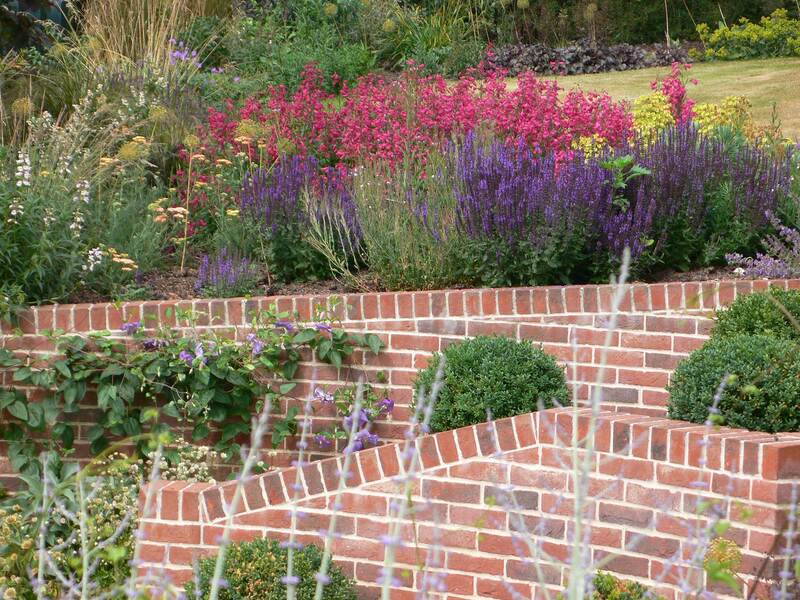 This sloping garden is on Mersea Island. Hard landscaping has been used to create level areas for working and walking and to help manage rainwater runoff. Most fruits grow on perennial plants (strawberries, raspberries, gooseberries and blackberries) or they grow on trees. So they will be part of the permanent planting in your garden design. If you want to grow berries or cherries, I’d strongly recommend installing a fruit cage, or at least some sort of protective covering. Birds love berries just as much as we do – and they get up much earlier in the morning than us to make sure they get the best bites. To save space, fruit trees can be trained to grow against a wall or they can be trained to form beautiful archways or walkways. Again, be aware of drainage and shade. Home grown peaches, nectarines and apricots are uber-delicious but the trees will need to be protected against frost. Again, take advice from a landscaper or garden designer if you’re not sure. It’s better to be safe than sorry! 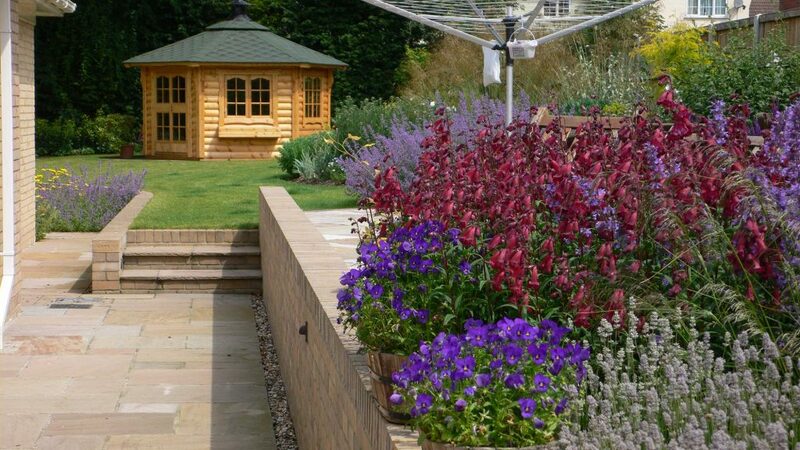 If you have room for one in your design, a greenhouse or a polytunnel is a real bonus. A polytunnel gives you an extra 6 weeks of growing time in a year. You can have strawberries ready in May instead of June, grow rocket all year round and even grow fresh new potatoes to eat on Christmas day.